Are You Paying Too Much for Your Enterprise Survey Software? Are you paying thousands for enterprise survey software? Would you buy a car that gets only 8 miles a gallon? Both are hard to justify. Both waste money. And both have forgotten Rule No.1. In this article, I’ll explain why you don’t have to pay exorbitant fees for premium survey features when you can get the same functionality and more with SoGoSurvey. Before I do that, what exactly does enterprise survey software mean? Why do you need enterprise survey software? Surveys have evolved from casual feedback gathering exercises to powerful strategic weapons for modern customer-focused organizations. These forward-thinking companies are interested in hearing from the silent majority who aren’t outspoken on social media. They want to turn customers into promoters – loyal enthusiasts who will keep buying and refer others. They need to respond to customers in real-time. They want to hold onto high-performing employees. And they need more than what’s offered in popular, ubiquitous, low-end survey tools. What features define enterprise-class survey software? Multi-user accounts: Manage user access and collaborate securely. Powerful analytics: Drill down by question, do side-by-side comparisons of demographic groups, and evaluate response trends. Guaranteed anonymity: Receive candid responses without taking extra steps or spending extra money to ensure confidentiality. Automated alerts: Get notified when customers respond negatively to a survey question so you can respond in real-time if desired. Advanced branching logic: Navigate participants to targeted questions based on a range of conditions. Complete brand control: Match the entire survey experience to your brand – from colors to invitation. Merge multiple surveys: Analyze and report on data from several surveys in one place. APIs to integrate with other systems: Automate the survey process and integrate survey data. SSL encryption: Protect sensitive data by encrypting survey responses during transmission. Survey vendors that don’t show prices on their websites offer many of these features; the problem is, their prices are just plain exploitive. 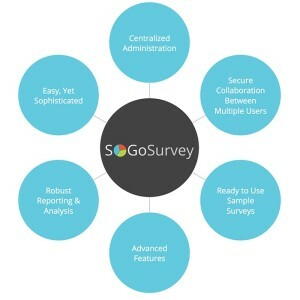 SoGoSurvey offers all these features and more―at an affordable price―in other words, Rule No. 2. See our pricing page to learn more about SoGoSurvey for enterprise teams.